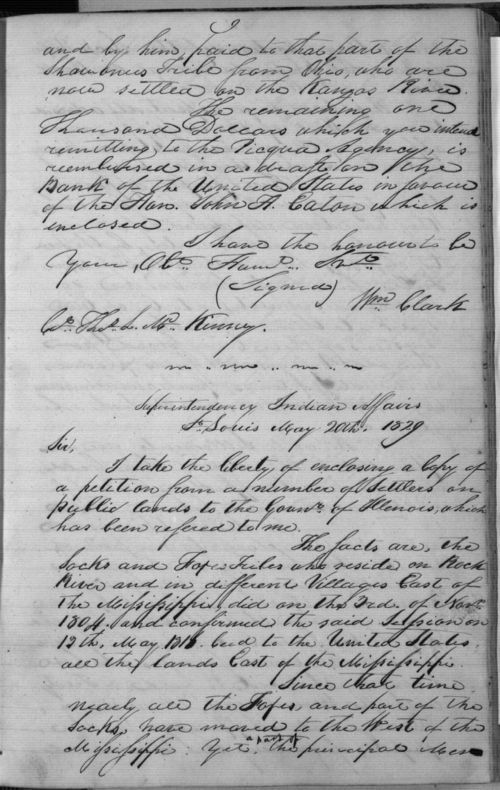 This letter contains a copy of a petition from Illinois settlers who were displeased that the Sac and Fox tribes, who ceded their lands in 1804 and 1816, had not moved to their new lands west of the Mississippi River. The settlers admitted that most of the Fox tribe and some of the Sacs had indeed relocated to Indian Territory (present-day Kansas), but a large group at Rock River (led by the warrior Black Hawk) refused to leave. These white settlers feared that tension between these natives and their white neighbors would lead to conflict, and that the government should force this group at Rock River to move west with the rest of their tribe. This source provides an excellent example of why and how natives' resisted removal, and it will be particularly useful for discussions of the Black Hawk War. It also shows how white settlers in Illinois were greedy for land (a primary motivation for Indian removal). This letter provides solid background for the letters from April 24, 1832 and May 1, 1832 also selected for this 7th-grade standard (both letters are from the Clark Papers and discuss the Black Hawk War) There is also a portrait of Black Hawk that was selected for this standard.